Social consciousness, or the awareness of society, is central to the experience of being human. In order to participate as contributing members of the community and broader society, children need to learn to not only be responsible for themselves, but also for others and the environment. This social responsibility involves a deep awareness of our interdependence and interconnectedness with the entire web of life: the human, animal and natural world (Warren, 2000). 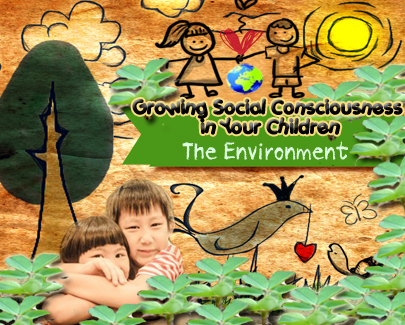 This article focuses on the environmental domain of social consciousness, known as environmental consciousness. Environmental consciousness refers to a concern for the impact that human actions have on the natural environment and an interest in preserving the quality of our precious natural resources. Environmental consciousness also involves concrete efforts to reduce our “carbon footprint” and work towards long-term sustainability. Teaching kids how to “go green” is a powerful and effective force of change, given that the future of the planet lies in the hands of those who will inherit it. Developing environmental consciousness can help children discover their values and abilities, and what part they can play in a complex and diverse world by drawing upon their strengths. Beginning this process in the formative early years, when children are open and receptive, and first form opinions about the world around them, is essential. Dads should take advantage of the idealism of youth to spark off children’s enthusiasm for social change and encourage them to become an important ally in society’s overall efforts to enhance the environment. Here are some ideas for fathers to raise their children’s awareness of the state of the environment and what they can do to be involved. Explore the great outdoors together. Recent research has shown one of the most critical factors in fostering environmental consciousness is simply the act of getting children outdoors. As prominent environmental educator David Sobel eloquently stated, “One transcendent experience in nature is worth a thousand nature facts.” It appears that children who have an immersive experience in nature between the ages of 5 and 10 foster a deep love of the environment that they carry with them their entire lives. Participate in environmental projects. Find ways to involve kids in projects that support the environment. These can range from a neighbourhood newspaper drive to a litter clean-up at a nearby park. Teach children about food sources. Explain to children how food grows and is harvested. Take them to fruit farms to pick their own berries. By gaining knowledge of how we depend on the planet for our food, children will understand why we need to take care of soil and water. Grow a garden. Gardening deepens children’s awareness of the cycles of life and the laws of the harvest. Planting a garden and then helping the children work, water and later harvest will give them an appreciation for nature, the earth and the environment. Plant a tree. Planting a tree at a park or in your own residential estate will give you an opportunity to teach your kids about trees’ positive impact on humans and the environment. Explain to your children and let them experience how trees help purify and cool the air, provide shade and shield from ultra-violet rays. Take an ecological vacation. Instead of flying to a faraway destination and staying in a hotel, consider going camping or hiking to a local wilderness area. This expedition is not only better for the environment, but is more economical and promotes physical activity. Recyle. Set up a family recycling station in your house and designate different bins for different materials such paper, plastic, soda cans, and glass. Show your children how to sort items, and discourage them from throwing recyclable materials into the garbage can. Re-use. As much as possible, try to only purchase items that are durable and can be re-used. Eliminate disposable paper cups and plates from your home and carry re-usable bags with you when you go grocery shopping. Put your kids in charge of making sure you have the bags each time you visit the store. Reduce consumerism. Do a stock-take of your kids’ material possessions such as toys, electronics and clothes. Rather than buying them more of these, think of alternative “green gifts”. For example, you could take them on a green adventure to the zoo or enroll them in their favourite sport or dance classes for their birthday. Also encourage them to give their friends non-material gifts. This will help change the prevalent mindset that gifts need to be tangible objects. Unplug often. Educate your child on how much energy can be saved by unplugging their electronics such as video games, computers, cell phone cords and radios when not in use. On a cool day, use the fan instead of the air conditioner. These efforts will help to save energy and also decrease the monthly electricity bill. Use water responsibly. Teach kids to only turn on the water on when needed. A lot of water is wasted when a child is brushing their teeth or washing their hands. Remind them to turn the water off while they are engaging in other activities. Get your children involved in doing the dishes or laundry and teach them to only run the dishwasher or laundry machine when there is a full load. Find alternative modes of transportation. Encourage children to walk or ride their bicycle, if their destination is within reasonable range. Cutting down on driving or taking a cab will reduce the amount of toxic fumes that are released into the atmosphere. Teach children about waste disposal. Take children to a landfill or water plant to witness how composting works or how the sewer system flows. By understanding that things don’t magically “disappear” when we are done with them, children will truly appreciate the value of recycling, reducing and reusing. Fortunately, children are quick and keen learners so when dads teach them how to go green early in life, green living choices easily become second-nature for them. At the same time, help them adapt to a green lifestyle gradually. Do not overwhelm your kids with dramatic changes all at once. Instead, only introduce a few green lifestyle changes every month and focus on sustaining them.Ultimately, by instilling in children a sense of environmental responsibility, you will raise the next generation of environmental activists who will help save the planet.